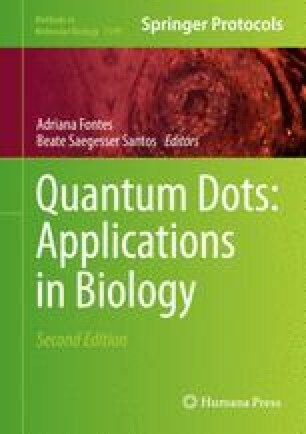 This chapter describes the processes of antibody (Ab) production, purification, conjugation to quantum dots (QDs), and the use of the conjugates produced in intracellular imaging of cell components and structures. Specifically, information is provided on the conjugation of carboxyl surface-terminated QDs to Abs via a one-step reaction using the water-soluble carbodiimide, 1-ethyl-3-(3-dimethylaminopropyl) carbodiimide (EDC). The chapter details the process of conjugate optimization in terms of its final fluorescence and biological activity. The method described should guarantee the production of QD–Ab conjugates, which outperform classic organic fluorophore–Ab conjugates in terms of both image definition produced and the longevity of the imaging agent.